– Where there is self-doubting, I wish you a renewed confidence in your ability to work through it. – Where there is tiredness, or exhaustion, I wish you understanding, patience, and renewed strength. How incredibly touching and poignant. God speed little Gabby and God bless her family. Praying for you guys. Daily. Oftener. Thank you for sharing this video of your precious little girl. Your family remains in my prayers! Thank you so much for sharing Gabby with the world! What a BEAUTIFUL tribute to someone gone too soon . Fly little Angel ! my Daughter Elyssa is up there too (she’s the one with the crooked pig tails and the 6’8″ angel Grandpa calling her GEORGE. I know she’d love to hug you and play until your family sees you again someday! HUGS TO HEAVEN GABBY! HUGS HERE GABBY’S FAMILY! can not take this pain away. I am so deeply sorry for the loss of your dear daughter. I am praying for the whole family. May God be with you and be your strength as you walk through this very difficult time. What can I Do To Help? Gabby went from being a Princess to a QUEEN with WINGS.. Fly High ANGEL l… Fly High…My thoughts and prayers are with Mom and Dad family and friends… sending Love, Prayers, and Hugs your way! Absolutely the most beautiful thing I have ever seen!! Have been crying for days, breaks my heart!! Gorgeous little angel!! Rest in peace!! Beautiful Gabby gone from this earth way to soon. Her story breaks my heart for your family. Video speaks volumes of everyone’s love for Gabby. Her life has touched me to my soul. Thoughts and prayers to your family. thank you for sharing your life with us and showing us the emotion that you were all feeling during this time. i cant begin to imagine what you must be feeling and knowing that looking into her eyes, taking pictures and hearing her tell you she loves you,would be some of the best moments during this horrible fight!! she is a beautful soul and i can only hope that she is happy and free now from her pain and continues to watch over those she loved. That was so beautiful!!! You were so strong for Gabby when it seemed impossible to be!!! I look up to your family for that and wish you all of the love and support in the world. While you will get through this, you will never stop believing!!! Can’t watch it now, I hurt too much for Gabby’s family. Someday…Love to everyone touched by this precious child. OMG!!!!!!!!! I just watched this video, i did not cry till i saw the tattoo. I am so sorry for your loss. Sending love and thinking of you often. What a beautiful video…I will always think of Gabby and your family when I hear that song. What a beautiful and touching tribute to a sweet girl. Vogels, your dignity, strength and poise last evening during what is the most terrible thing a parent and sibling can experience was truly inspirational. Rest in peace sweet gabby and may god bless your family. Beautiful video. I can’t imagine the pain that your family must be going thru. I hope and pray that your family finds the strength to move forward. knowing that Gabby is finaly at peace and out of pain. I pray for you every day. We will miss the little angel. What a beautiful tribute; watched it through tears. Thank you for sharing this with us. What a beautiful video. Sweet Princess sleep well and I look forward to meeting you in heaven to say thank you for all your life and strength have given us. I believe and know you are watching over your family. I never met her. In fact I didn’t even find your page until it was featured on Prayers for Delaney’s page. But I feel like I miss her. I have been, and will keep praying for your family. this is proof that angels exist. See you later sweet angel baby…. One thing I feel is that Gabby was not able to talk when she left her body on this earth, however she sure made a lot of noise through all the thunder and lightning when she left it! It is amazing to me that I witnessed the whole storm from outside Phoenixville. It started after 8:15 PM while I was In Sanatoga. We could see the sky lighting up in the distants like fireworks. At the time I did not know where it was coming from. As I drove home to Royersford the thunder got louder and lightning came quicker. Thought for sure we were going to have one hell of a rain storm. However, after 10:30 PM it rained only a little. My friends were writing all about it on fb. They lived all around the area. For as big as the thunder and lightning were to have just a tiny bit of rain was unbelievable! Then Later to read about Gabby’s passing I knew for sure it was her exit! I feel Gabby is still here with us just not in her life body form! For those that knew her well, look for the signs she leaves! They will be all around you! Just got to look and listen! Might be a smell she really liked or a noise she loved to hear or make. A song on the radio when you are thinking about her or sad. Maybe a favorite bird or butterfly flying by you. Vogel Family – you all are truly inspirational! Thank you for sharing your journey with us. I can’t begin to tell you how much your story has changed those who heard it! Endless love, thoughts, and prayers being sent to you daily! Gabby ~ what an amazing little lady. We’ll never forget you!!! Keep coloring the sky for us! Wow…….very moving. Rest in peace sweet girl. You will be missed even by those who never the priviledge of meeting you. 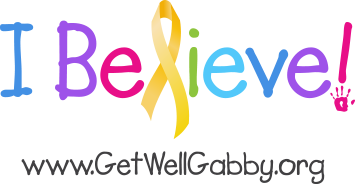 Thank you for sharing Gabby’s story and journey with us. My heart was so heavy today thinking about your family. I played in a golf tournament today and told my playing partner that I was playing for Gabby!! We are really sorry to hear about your loss and send our love and prayers your way. Gabby was a precious little angle, and will be missed. She is in God’s most loving hands and being cared for with the utmost love and affection. What a Beautiful tribute to Gabby! Thank you for sharing this! My prayers are with Gaby’s whole family. I believe in The Vogels. Truly amazing. Thank you for sharing. Gabby fought the good fight. You taught us all to believe and believe we did. She is such a precious angel now. I know this loss is huge, and how much you are hurting. I send you prayers of comfort and strength. Gabby will forever be in your hearts….Her spirit will be a beacon of light… Now and forever…. To The VOGELS: You are all true superstars!!! What amazing parents you are to handle yourselves in such a loving, caring and open way for all of us to meet (via in person or internet) Gabby and her amazing sisters!!! From the minute I learned of Gabby and her fight MY FAMILY lit a candle at church and began OUR prayers…..Mr. Vogel I have fought with GOD many times…I lost my father at the age of 25 with four younger siblings…my youngest being special needs and truly attached to both my parents…..he was a senior in the only high school HE wanted to go to MSGR. BONNER (Upper Darby, PA) where our father went to…..He struggled but the school united and helped him through……..he is an amazing kid and won the MOST prestigous award……….my family struggled…..then our mother got sick she lost her very short battle with cancer……..my parent were BOTH lovers of CHILDREN……….I am at such a loss they arent here to meet OUR children…….PLEASE PLEASE REST ASSURE THEY WERE THERE TO GREET GABBY AS SHE ENTERED THE GATES OF HEAVEN……..My mother I am soooo sure will be he ” angel” in heaven making sure she is loved and cared for……….my mother’s love and affection with children is something I have inherited and LOVE>…….children are what makes the world go round!!! I cant begin to imagine what life is like to endure watching you child battle the ugly “C” but I watched both my parents battle it and also take their last breath………..Im now whatching my YOUNGER sister battle terminal colon cancer…………..she is 34 with a 4 and 3 year olds…………it breaks my heart………but she has my parents up their we HOPE AND PRAY letting her enjoy the precious moment sof watching her children grow……….GABBY spread your wings and FLY HIGH!!!! Let the world know you are free of pain and helping others to endure or overcome their pain!!! You are a true angel in my eyes!!!! xoxoxoxo MaryEllen Hoffman!! God Bless Heavens new angel and may she look down on her family and surround them in peace and comfort them, cannot express my sorrow enough for her friends and family and all who loved her …God Bless you Gabby ! What a beautiful tribute to a beautiful girl’s valiant fight for life! Gabby has captured a piece of my heart and has forever touched my soul. I strive everyday to be a better mom because of her and for that I thank you for the courage to share your family’s story with all of us. I hope that someday soon, you will be able to focus on the 67 months of joy that she brought to your lives and that the 4 months of hell will fade in your memory, that the pain of losing her will be replaced with smiles as you remember her running and playing with her sisters. I hope that you or a close family member will post a new video montage of these happier times because, as horrific as these past months have been for you all, Gabby’s legacy will be more than a little girl who lost her fight with brain cancer. She is and will continue to be an inspiration to all about how to live life like a 5 year old, to run, to laugh, to love, to Believe! For such a little girl, to touch sooo many lives. God bless your family. You hug katie and maddie anyway. You believe in God’s love. Gabby will always be in my heart. You are an angle to many! You have opened your life up for all to be part of and this video just brings us that much closer to your family and Gabby. Thank You isn’t enough but I have no other words to say. As a mother of two little boys I can not even imagine what you are all going through but I am so grateful that you have been sharing your amazing daughter with all of us. It reminds me everyday to be grateful even for the days I think are rough! To make the time for my kids first and put everything else second. I am so so heartbroken that Gabby didn’t win her fight but honored that you have chooses to share it with me. May her memory be eternal and her spirit continue to live through all of us. just watched Gab’s video again. so painful. i’m so sorry for your lost. she is such a beautiful little girl that has touched so many. i don’t recall how i came across your site and began to follow your story months ago but since that day, not a day goes by that i don’t think of little gabby, that sweet little girl that captured our hearts. may you someday find peace and comfort again – thinking of you and the girls that surrond you now. Just watched again . . . why do I miss a child I have never met? Why do I feel the urge to hug her parents and sisters and cry with them? Gabby . . . such a sweetie, I am sorry for all you had to endure. I am sorry your time here was so short . . . but the suffering is left to those left behind, not to you. God bless you and may your beautiful spirit shine on and live on in your family always. I love you, sweet Gabby. http://www.cnn.com/2011/09/23/living/crisis-apparitions/index.html?hpt=hp_c1 the worl is a mystery, this may help you in some way…..
One word to describe your baby girl and this video….BEAUTIFUL!!!!! !